Ahh, Coffee! opened December 13th, 2005 and quickly became an Eastport neighborhood fixture. A place where we know your name, your order, your kids, and even your dog! With our amiable crew and our wonderful regulars, we have developed a "home away from home" atmosphere. Whether you're a local or just visiting Annapolis, we invite you to share in enjoying a cup of our locally roasted coffee or some of our locally sourced pastries and bagels and good company. FROM DOWNTOWN ANNAPOLIS: From the Market Space area enter the traffic circle and take the first right after Main Street on to Compromise Street. This will take you over the Eastport Bridge and Compromise becomes 6th Street. Continue on 6th street for 2 traffic lights, make a right on to Bay Ridge Avenue (Royal Farms will be on the right). Continue on Bay Ridge Avenue for a little less than half a mile, you will pass the post office on your left and then approach the Eastport Shopping Center where we are located. Ahh, Coffee! is on the side of the shopping center that runs parallel to Bay Ridge Avenue. FROM US-50: As you approach the city of Annapolis take exit 22 for MD-665E/Parole and continue on 665 East which becomes Forest Drive. Continue on Forest Drive, pass the Safeway on your right and anticipate merging into the left turn lanes to turn left at Hilltop Lane (two lights past Safeway). You'll want to be in the outside/right side turning lane to continue on Tyler Avenue, take a left at Bay Ridge Avenue continue for about a half a mile and you will see the Eastport Shopping Center where we are located. Ahh, Coffee! is on the side of the shopping center that runs parallel to Bay Ridge Avenue. We proudly brew Chesapeake Bay Roasting Company coffee and espresso, and Two Leaves and a Bud tea to make all your favorite beverages. We offer soy, almond, and coconut milk alternatives in addition to dairy milk. We use a variety of flavored syrups and chocolate sauces to create our specialty lattes and mochas. Choose from our menu or create your own. Our signature latte is made with "spiced" cocoa, espresso and your choice of milk. A little cinnamon-y, a little nutmeg-y, a lot chocolate-y, all yumm-y. These effervescent coolers are made with your choce of flavored syrup plus club soda. We serve bagels and pastries from a variety of local bakers to ensure that you're getting the best of all worlds. Assortment of flavors delivered fresh, daily. Choice of cream cheese, butter, or peanut butter. Apple or Cheese danishes, Almond croissant, Butter croissant, Pain Au Chocolat (Chocolate croissant), Bostock, and Sticky Buns. Follow us to keep up with our drink specials, coffee of the moment, artist of the month and whatever meme amuses us that day. Ahh, Coffee! loves the arts and supports local art by featuring the work of a local artist each month. Art is available for purchase through the shop for the duration of the artist's month. If you would like to be a featured artist please contact management at art.ahhcoffee@gmail.com for information and scheduling. Ahh, Coffee! would like to cater your event! Whether it's a meeting, pre-wedding refreshments, or graduation breakfast, we would love to be there. Offering coffee, juice, bagel and/or pastry services. Prices below are pre-tax. Please contact management for a complete quote and for booking. 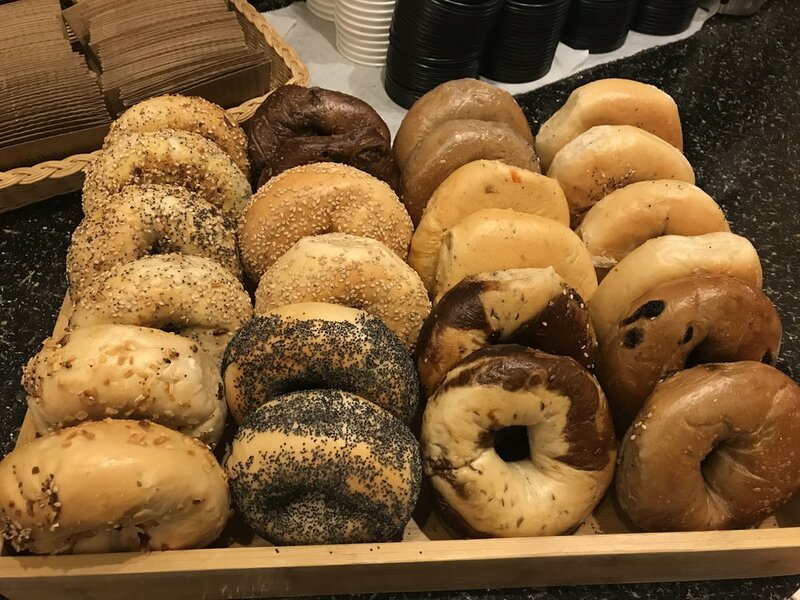 Bagel/Pastry Service: Assorted bagels and pastries, cream cheese, butter, plates, knives, etc. Delivery Fee: $5.00 within the city of Annapolis, price to increase with distance.